If you’ve read recent headlines, you’d be forgiven for thinking that eating a sausage is tantamount to writing a suicide note. Last week the World Health Organisation placed processed meat in the same carcinogenic category as cigarettes and alcohol. Regular red meat was placed in the category below, making it a ‘probable carcinogen’. Crikey! This WHO report stated that eating 50g of processed meat a day raises the risk of bowel cancer by 18%; a previous study linked meat, particularly processed meat, with Type 2 diabetes. All of which kicks a hole in the traditional British diet of fry ups, bangers and mash, and roasts. There’s been something of a backlash on both sides of the Atlantic with social media awash with jokey ‘save our bacon’ campaigns. But there is a point behind the humour: the findings are easy to misinterpret and that leads to scaremongering. The WHO report comes from its International Agency for Research on Cancer (IARC) which evaluates the strength of evidence for a substance (cigarette smoke, sunlight, sausages for example) being carcinogenic, not the cancer risk itself. So the report says the evidence of a link between processed meat and cancer is as strong as the evidence of a link between smoking and cancer. It doesn’t say the risk of processed meat causing cancer is as strong as the risk of smoking causing cancer. All that said, our research for Kale & Cocoa has led to Annabel and I to eat less meat. So a book published today (Nov 5) Proteinaholic, is right up our street. Written by a bariatric surgeon, Dr Garth Davis, it claims to debunk the myth that animal protein makes us lean, healthy and energetic. Back in the day Dr Davis was a leading proponent of the Zone Diet which recommended 30% protein, 30% fat and 40% carbs. But it didn’t work for him and he found himself overweight and under the weather. He researched Blue Zones (areas of the world with the highest percentage of centenarians – look out for Annabel’s post next week) and over 800 scientific studies on nutrition and health. He extrapolated from all this research one simple message: “an animal protein-rich diet is associated with a shortened life.” He believes that diets like Atkins and Paleo have led us to fetishise protein and by overeating this macronutrient we are putting ourselves at risk of diabetes, heart disease and dementia. Dr Davis is now a vegan and is raising his young daughters as vegetarians. So how much protein do we need each day to keep muscle mass and provide essential amino acids? There’s a simple equation to work it out: we need 0.8g of protein per kilo of body weight per day. So a woman weighing 60kg needs 48g of protein a day. 100g of chicken contains 27g, and an egg 13g, so it quickly adds up. Plant-based sources of protein need a little more thought, but there’s 9g in 100g of lentils, 8g in two tablespoons of peanut butter and 4g in two tablespoons of chia seeds. Meal planning for a family needs a little more thought too. I cooked my first properly vegetarian roast on Sunday, and I have to say it was delicious, even gaining approval from my meat-free daughters. It took some prep – it seems easier to bung a joint in the oven than to think creatively about lots of different vegetables dishes. But with some forward planning and a semi-willing sous chef we managed to serve up: stuffed butternut squash, braised red cabbage (I had that in the freezer so I just had to defrost it) steamed green cabbage, roast potatoes, Yorkshire puddings, roast winter roots and sprouts and Anna Jones’ sticky roasted veg gravy (that wasn’t a great success). 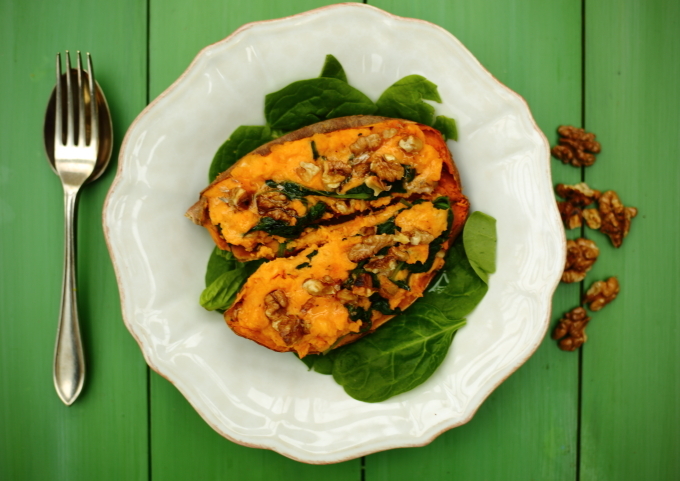 The stuffed squash served as a centre piece in the way that a joint of meat does, and the cheese and walnuts provided protein. The recipe below works for individual sweet potatoes, but you could easily adapt for one large butternut squash as we did on Sunday. Scrub the outside of the sweet potatoes, but don’t peel. Cut a long slit down one side of each potato so the steam can escape as they cook and they are easier to split open. Place on a baking tray and cook for approximately 1 hour, until they are completely soft and cooked through. Leave to cool while you toast the walnuts in a dry pan. Put to one side then wilt the spinach. Switch off the heat and stir in the goats’ cheese, mustard, most of the walnuts (reserve a few for decoration) the nutmeg and seasoning. Split open the sweet potatoes, and scoop out the flesh, leaving a thin layer of potato behind so the skins keep their shape. Mash the sweet potato flesh with the spinach and cheese mix then stuff it all back into the potato skins. (They can be left to one side or put in the fridge for a few hours at this point). Sprinkle the remaining walnuts over the top and pop back into the oven for 15 mins to heat through. What a clear and informative explanation of the recent WHO report about meat, thank you. I am busy forwarding it to all my meat-eating friends ! I love recipe for baked sweet potatoes, too. Onwards and upwards with persuading the nation to be healthier – great work!! Thanks so much Dawn – lovely comment!